Tarkio Kayak Adventures offers a multitude of lessons, trips, and clinics geared towards their clients’ personal needs and skill levels. They specialize in multi-day instructional clinics that lead to increased skill-development. 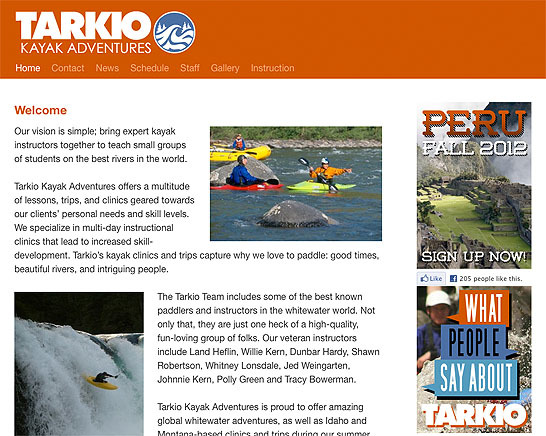 The Tarkio Team includes some of the best known paddlers and instructors in the whitewater world. Owner Land Heflin was recently featured on the Discovery Channel making first descents down virgin rivers in Bhutan. They needed a no fuss solution that could be easily updated anywhere they could get a signal. For a website as rugged and worldly as they are there was only one solution. WordPress – the Swiss Army Knife web development tool.